I remember reading about this issue on the first gen Surface Pro, but I believe history may be repeating itself with the Surface Pro 3. I had my unit for 2 weeks when I began to notice it, in particular when web browsing with white backgrounds. 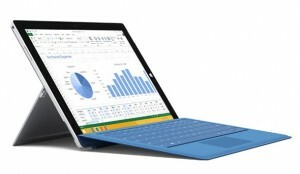 After reading this entry and checking out my Surface Pro 3, I see what’s being discussed here. I can’t see what’s causing it, but I’ll note that there’s some distortion in the screen at this location when pressure is applied (say, when cleaning with a microfiber cloth). The distortion can only be seen on black screens (but with the backlight on, e.g., when the machine is booting), and this is precisely where the “yellow haze” (or on non-white screens, a discoloration of whatever color is being displayed) is seen on a lit screen. It’s logical to conclude that the two issues might be related. I’d be tempted to call this backlight bleeding, but it’s very uniform across the entire length of side and there appears to be a cap between the line and the edge of the screen. If you have a Surface Pro 3, does your screen have this issue? My plan is to wait a little while for Microsoft to work out all of the hardware kinks. Then, I’ll probably have mine exchanged via my Microsoft Complete extended warranty if this issue doesn’t resolve. It’s JUST noticeable enough that my eye is drawn to it while I’m using the machine, which is a bit annoying. I have the same model (i5, 256GB, 8GB RAM) and I noticed the faint yellow bar in the same spot on the left of the screen. I exchanged it at the MicrosoftStore for a new one and have the same issues with it. The new one seems to have a faint line at the bottom of the screen too. I’ve looked at different display units and noticed it on about half of the units at different stores. I’m not sure if it’s a defect in the screen or simply the edge lighting of the panel bleeding through. That being said, for the price tag I’m not willing to just live with it. I’m interested to see what the root cause is…. I went ahead and processed a return for mine, and was told by the support rep that this is a known but “uncommon” issue. I was assured that my replacement wouldn’t have it, which I find dubious but of course we’ll see. I’ll report back on whether or not my replacement unit has the issue. I agree, this isn’t acceptable, and I too am curious as to what’s causing it. I’m not sure that it’s simply light bleed, because there’s actually the yellow strip is separated from the edge by a very thin white line; I’d be more tempted to think that it’s adhesive, but that should fade over time. So, I’m at a loss. Is there a protective film over the screen that should have been removed? Plastic tends to yellow, while glass doesn’t. Did the exchange solve your problem Mark? I noticed the same thing on mine today. I was looking at a white background website and noticed this hue that looked off. At first thinking it was my eyes, I’d adjusted brightness and moved screens around it, and it was there. I searched and found this. Glad my eyes aren’t that out of sort, and sad my surface has developed this defect. Same problem. MS replacing the SP3 and hoping that sorts it. Good luck. If you get a chance, please report back whether or not the issue exists on the new unit. having the same issue with my surface pro 3. left line looks haze yellow on white and dark gray on black. Wow, that’s actually considerably worse than mine. I’d definitely see to getting that replaced. Mine is a solid yellow line down the left-hand side only, and it’s nowhere near as noticeable as yours. I have the Surface 3 just purchased in May and it has the yellow haze on the right and left of the screen, I just noticed it today. I saw pictures of one that is worse I wonder if it progresses. For what it’s worth, mine didn’t progress. It didn’t get any better, mind you, but it didn’t get worse. I have the same issue on my S3pro i7. Called Microsoft support but the surface warranty was expired by 2 months. I was quoted $350 to replace the screen. I argued wit heir support that his is a product defect that affects a lot of people but no go. I am not sure what to do but the price to replace it is insane. It is a little disappointing considering how many people complain about this. Any ideas? Unfortunately, if you’re outside of your warranty, I don’t think there’s much to do about it. $350 for a screen on a notebook isn’t unheard of, and on a machine like the SP3 it’s not at all surprising. What IS surprising is that they actually replace the screen–repairs on these things seem very difficult. In warranty, Microsoft just replaces the entire unit when there are issues.